Fully inclusive at the Hide in Hwange. 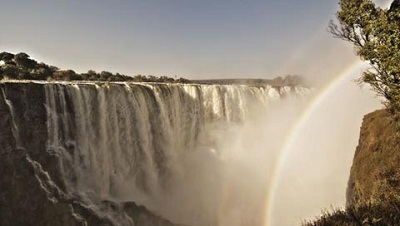 The Flights between Johannesburg and Victoria Falls return are included in the cost. Protea Hotel OR Tambo Airport (Standard Room, Breakfast) - The pristine four-star Protea Hotel OR Tambo is set in the heart of Kempton Park, minutes from OR Tambo International Airport, South Africa's largest airport. Themed around an aircraft hangar, the industrial ambiance of the Hotel is felt in the polished concrete floors, steel finishes, chrome lighting and top to bottom windows that overlook the aeroplanes as they land and take off. The bedrooms are quite spacious with tea/coffee facilities, desk, flat screen TV, telephone and open place bathroom with an in-room shower and vanity basin and an enclosed toilet. Time-conscious travellers can enjoy a convenient location 35 minutes from Sandton and Pretoria and a dedicated, complimentary shuttle service to and from OR Tambo International Airport between 6h00 and 23h00 daily. After breakfast you take the hotels complimentary shuttle bus back to the airport. On arrival at OR Tambo Airport (Johannesburg), you check-in for your scheduled flight from Johannesburg to Victoria Falls in Zimbabwe. Victoria Falls Airport to Victoria Falls Town road transfer (Scheduled transfer per person) - On arrival at Victoria Falls airport, look out for our representative. They will be holding a name-board with your surname on it. They will transfer you from the airport to your hotel. 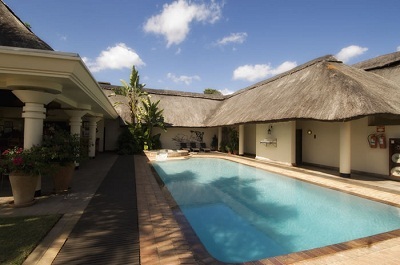 Ilala Lodge is a friendly boutique hotel which is the closest hotel to the Victoria Falls. The National Park borders the front of property and wild animals often graze on the hotel lawns with the spray of the falls in the background. Guests are accommodated in 32 charming rooms, of which 2 are Deluxe Suites. All rooms have en suite bathroom with separate shower, air conditioning, overhead fan and satellite TV and are served early morning tea/coffee. The Deluxe rooms can also accommodation an extra bed for children. There's also a charming swimming pool, pool bar, restaurant known for its good food and small sitting area. Sunset Cruise (Zimbabwe) - Scheduled Dinner Cruise - You are collected from your hotel and driven to the jetty on the Zambezi River for boarding. The boat meanders slowly upstream looking for game on the way. A number of animals and plenty of bird species can be viewed from comfortable chairs on cool wooden decks. Canapes are served on board and the bar is well stocked with spirits, good wines, beers and soft drinks. There is also an option to enjoy dinner on the Zambezi river for an additional supplement. Victoria Falls - The Victoria Falls is a dramatic scenic contrast and a change of pace from the private game reserves. It is a sight not to be - missed - the clouds of spray generated by this thunderous descent have resulted in a lush rain forest full of stunning wild flowers. A host of activities are centred on three separate delights: the Falls, the magnificent Zambezi River and the surrounding Zambezi National Park. To gain an overall impression of the Falls, the helicopter 'Flight of Angels' is essential. A microlight ride and bungee jumping are available for the truly daring. The Zambezi River has two characters - the wide gentle river above the Falls is the perfect place for languorous sunset boat cruises or gentle canoeing, whilst below the Falls, the more adventurous can enjoy serious white-water rafting or jet-boating. Game drives and horse riding are offered in the Zambezi National Park to view elephant and buffalo. Visitors can also sample elephant back safaris and take part in their grooming and feeding activities at the Elephant Camp. Victoria Falls Airport to Hwange road transfer (Scheduled transfer per person- ) Today you are collected you from your hotel in Victoria Falls. They will transfer you from the airport to Hwange Main Camp which is approx 2 hours. On arrival at Main Camp, you will be met by a representative from your safari camp and transferred by 4x4 through the park. This will take another 1 to 1½ hours depending on road conditions and will take the form of a game-viewing transfer. The Hide - Standard Tent, Fully Inclusive (3 Night Stay) - The Hide Safari Camp, a classic tented safari lodge, is situated on the eastern boundary of Hwange National Park in Zimbabwe. This owner-run camp has grown organically over a number of years with the owners constantly adding and improving the lodge. The Hide's main area is a picturesque A-frame thatched lodge with dining room and sun lounge downstairs and a large comfortable lounge/viewing area upstairs. Meals are generally a relaxed communal affair, served in elegance and style around their magnificent 22-seater Zimbabwe teak table. Breakfast is usually served alfresco under the trees. A tented camp is perhaps the definitive African safari experience, as you are able to hear the sounds of the bush all around you in the cool of the night. The small size of The Hide is one of its differentiating features, as this means that you have an intimate atmosphere in camp, as well as a greater feeling of the untrammelled open spaces of the bush when you are on a game drive. The Hide has ten large luxurious tents under thatch (7 standard and 3 deluxe). These have all been very recently upgraded with a modern feel. All have spectacular views over the main waterhole. Each is beautifully furnished with solid Zimbabwe teak furniture and en suite bathroom. Two of the tents have outside baths where guests can relax in a bath and enjoy the stunning view over the waterhole. An expert ranger is on hand throughout your stay, to take you on morning and evening game drives in Hwange and enable you to get the most out of your experience. On request these drives can be stretched out to include a picnic breakfast or lunch at one of the excellent waterholes in Hwange. The Hide can also arrange short night drives after dinner, because it isn't inside the National Park itself. Walks on its own private concession area can also be arranged with a professional guide - this is an excellent opportunity to learn more about the flora and fauna of the bush. The Hide safari camp boasts great bird life (over 400 species recorded) with great photo opportunities both out in the open or in the underground hide at the camp waterhole. Hwange National Park is Zimbabwe's largest and oldest game park ranging over an area of 14,600km². It lies only two hours' drive south of Victoria Falls en route to Bulawayo, Its size necessarily includes a range of vegetation and a resulting diversity of game, from the dry southern acacia scrubland bordering the Kalahari to the northern mopane woodlands, valleys and granite hills characteristic of the north. Hwange is big game country with massive herds of elephants, especially visible at the end of the dry season in September, as well as lion, buffalo, hyena, giraffe, zebra, wildebeest sable, roan and other antelope. The private game lodges are mostly adjacent to the park. Here you take part in early morning and late afternoon game drives in open 4x4 vehicles and game walks. Game-viewing in Hwange is made easier by the shallow salt pans throughout the park. These natural salt pans offer the perfect cooling mud bath for elephants. Ultimately the pans develop into small ponds. The best time to visit Hwange is in the dry winter months from July to October when the animals are forced to congregate around these water pans and ponds for much-needed water. Hwange to Victoria Falls road transfer (Scheduled transfer per person) - On arrival at Hwange Main Camp, you meet your road transfer representative. They will transfer you from Hwange to Victoria Falls Airport or to your hotel in Victoria Falls. This transfer will take approx 2 hours (plus the transfer time from your lodge in Hwange to this pickup point). On arrival in Victoria Falls, you check in for your scheduled flight to Johannesburg.